The Mortal Instruments: City of Bones game by PlayFirst has been released in some countries for testing. According to Triple Point Newsroom, this game will be officially released on Thursday, August 15. PlayFirst brings you a new FREE game based on the motion picture The Mortal Instruments: City of Bones, in theaters August 21, 2013! Become a Shadowhunter-- a half-angel, half-human warrior fighting an unseen war against demonic forces-- and join Clary, Jace, and other favorite characters from the film on their quest to protect our world and recover the Mortal Cup. 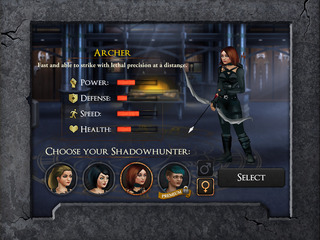 Customize your Shadowhunter's look and abilities from an arsenal of magical Runes and devastating attacks, then battle bloodthirsty monsters and horrific demons to become one of the most powerful fighters the world has ever seen.